The most translated book in the world after the Bible, the Tao Te Ching, or "Book of the Tao," is a guide to cultivating a life of peace, serenity, and compassion. Through aphorisms and parable, it leads readers toward the Tao, or the "Way": harmony with the life force of the universe. Traditionally attributed to Lao-tzu, a Chinese philosopher thought to have been a contemporary of Confucius, it is the essential text of Taoism, one of the three major religions of ancient China. As one of the world's great works of wisdom literature, it still has much to teach us today, offering a practical model based on modesty and self-restraint for living a balanced existence and for opening your mind, freeing your thoughts, and attaining greater self-awareness. With its emphasis on calm, simplicity, purity, and non-action, it provides a time-tested refuge from the busyness of modern life. This new translation seeks to understand the Tao Te Ching as a guide to everyday living and encourages a slow, meditative reading experience. 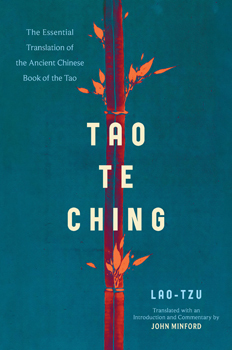 The Tao Te Ching's eighty-one brief chapters are accompanied by illuminating commentary, interpretation, poems, and testimonials by the likes of Margaret Mead, Ursula K. Le Guin, and Dr. Wayne W. Dyer. Specially commissioned calligraphy for more than two hundred Chinese characters illustrate the book's essential themes.